Our company specialises in the production of plastic parts and small series of 3D prototypes that are as close to reality as possible. 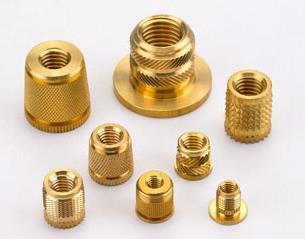 To this end, we offer various applications, in particular the overmoulding of metal inserts. 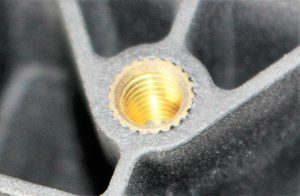 Overmoulding and inserts are used in plastic injection for various sectors, such as automotive and connector engineering. An insert is an attached piece, generally made of a metal such as steel, aluminium or brass. Its purpose is to be fixed into the plastic part. It may be full or tapped for the insertion of a screw. With 3D plastic prototyping, it is possible to simulate the overmoulding of inserts in order to approach the functionality of series parts. In rapid prototyping, overmoulding with inserts is an application produced with vacuum duplication and 3D machining. The moulding of metal inserts in plastic parts has several major advantages. First of all, a metal insert allows a part to be reinforced. Second, it allows the inclusion of the functionality of a screw thread on a plastic part. Finally, it can serve as a connector for the conduction of electricity. The insert can be fixed in two ways. It can be applied manually to the interior of the mould before the material is injected. It will then be integral with the prototype part. Secondly, it can be inserted by hand after producing the part and extracting the mould. Our mastery of vacuum duplication allowed us to produce the part below with inserts. The customer asked us for a set of 20 parts, each with 8 inserts. Thanks to their visual and functional rendering, the prototypes made it possible to promote the product that could be commercialised in the market. An article detailing this project is available here. Our workshop is capable of producing prototypes and plastic parts with applications. We are capable of prototyping visual and functional parts with 3D plastic machining and vacuum duplication. If you require small series of plastic parts, send us your request via our quotation page.